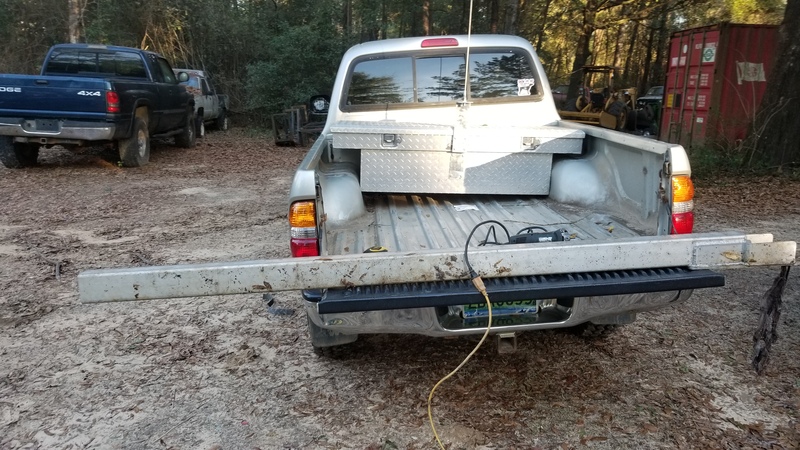 A friend with a local towing company had me come rebuild some hydraulic cylinders on one of his trucks and told me I needed to look at his yard and see if I was interested in anything before they got hauled to the pull a part. Saw this from a distance and couldn't really get to it but I knew I wanted it. A few months roll by and he is to the point where it was time to haul to junk yard. All the others were hauled off so this one was easy to get to. I had been under the impression it was a pre runner. As we hooked up to it to put on the trailer i saw the front diff and got happy. Got it home and a friend helped vacuum all the glass from the floor. The ignition was in pieces for some reason but after a bit of fiddling it was back together and accessories worked. Spin over ni fire or fuel. No power to ecm. A friend looked at it while I was at work Friday and found the ignition switch was missing some pieces. Grabbed one from the u pull it and got it running. No crazy plans. I need a streetable 4wd that I can tow my boat with, put a dog box in the back, just be able to drive normal unlike the trail rig. Door handles and 3" spacers for the front arrived friday. New struts will be here Wednesday. I put the original spindle back with new ball joints and tie rods. New cv axle and brake rotor, caliper/pads. Got a lower control arm from u pull it. Have to come up with a bumper plan and it will probably not be pretty because I plan to use the 8274 on this one. Got a window and tail light for it Thursday after work. Friday I had taken off for a dog hunt but it got rained out so I worked on the truck. Put the window in, new door handles(btw 4runner handles will not work, fit in hole and bolt up but the rods are different and the locking mechanisms) and tail light in. Put some new tires and wheels on the car hauler and took it to the alignment shop. I'm hoping that I can run the 4runner wheels like the one on the front with the buckshots but it looks as if it will be very very close to the control arm. Will find out once the tires get here and mount one up. Somehow forgot to update that Wednesday evening I put the 2.5" leveling kit and new "struts" on. Need to find a true trac for the rear axle and still trying to find a fender. Got a warn vr8000 so I can maybe use a store bought bumper. Looking good. How's the noise from the tires on the road. Looking to eventually put pizza cutter's on my runner, these or tsl's are what I have been looking at. That's gnarly. Pizza cutters always get the crowd going. they're cool looking on just about anything. Lsd was not an option on tacoma until 2005. I know it doesn't have a locker in it. It was one of the first things I checked for. The buckshots are not street tires. They are not quiet. They do not ride smooth. I bought them for what they are. One of the best true mud tires you can get. They act just like their predecessors from the 80s. Once warmed they ride decent at best but get them in a sloppy mud hole and they out pull just about anything. I would not suggest them in any way shape or form so someone who wants to daily drive them. My friend frank cleaning up the frame where the alignmentahop said it was cracked. Just cracked paint. Played with the shear and brake at work to make a whip mount. My uncle has a set of R's on a cj5 with an AMC 304 and 3 speed. That is one great set up. Finished up the toolbox and got the bed liner back in. Just need to bolt it all down and ground strap it. Racking my brain over what the heck is causing the driver tire to lean in. Measured lca, UCa, finally got my buddy to bring over his 96. Measure from frame to spindle and found spindle is bent. I was pissed because they are outrageous. That is until I found a 2wd 4runner, prerunner, tundra, sequoia, t100 are all the same. So with an abundance of 2wd 4runners in the local u pull its. I should be in business next week. whenever someone looks at a rig with swampers, buckshots, ltb's, etc and asks "how do they ride one the road" I cant help but laugh at them. of course if you didn't grow up in the south, you've probably never even heard of buckshots ha. last time I checked though, maxxis was offering two different molds and one of them was rated for balancing. Maxxis is making a few versions. All street tires. The gateways are now sold by a Chinese company and they are just the same old tires. I wish they made more than 2 sizes but for now these work well. 2008 deer hunting and general hunting adventures - POSSIBLE BLOODY PICS INSIDE! !